Five 1930s Mercedes Benz 500 / 540 K Cabriolets are on sale at the Bonhams Mercedes Benz 2016 classic car auction at the MB museum in Stuttgart, Germany. Eleven cars are expected to sell for over a million dollar each at the single-marque sale at the Mercedes Benz Museum in 2016. In addition to the 1930s cabriolets and 300s of the 1950s, a 1926 Mercedes Benz 24/100/140 PS, a 1971 600 Landaulet (dictators’ favorite) and a 2009 SLR McLaren are expected to sell for more or near a million euro each. The Mercedes Benz Sale is a single-marque classic car auction arranged by Bonhams at the Mercedes Benz Museum in Stuttgart, Germany on 19 March 2016. In 2015, six cars sold for over a million dollar each at the Stuttgart sale with the top result €2,760,000 for a 1938 Mercedes Benz 540 K Cabriolet A. Although the 500 and 540 K models of the 1930s will demand higher prices, the 1926 Mercedes Benz 24/100/140 PS Model K La Baule Transformable with coachwork by Jacques Saoutchik (estimate $880,000 – $1.3 million) is Bonhams’ leading car for the 2016 Mercedes Benz Museum Sale in Stuttgart. This supercharged chassis was developed for Daimler by Ferdinand Porsche in 1924 and survived the merger with Benz in 1926. Although produced in 1926, the chassis was only sold in 1928 and subsequently finished with La Baule-style coachwork with fully disappearing top by Carrosserie Saoutchik. Mercedes Benz 500 and 540 K models from the 1930s are generally the most-expensive German road-going cars sold at auctions. These cars are fairly rare with only 354 of the chassis 500 and 447 of the chassis 540 produced – all are elegant, many have unique coachwork. A 1935 Mercedes Benz 500 K Cabriolet C with coachwork by Carrosserie J. Saoutchik is the most valuable car on offer at the 2016 Bonhams Mercedes Benz Sale in Stuttgart. This one-off car has a pre-auction estimate of $6.6 to $7.7 million. The bare Mercedes Benz 500 K chassis was shown at the Paris Auto Salon where it was bought by a Californian banker, Dr Charles Crocker. He sent the chassis to Carrosserie J Saoutchik who fitted a unique cabriolet body. The car is restored but complete and authentic with even the original Art Deco vanity set still in place in the dashboard. The 1936 Mercedes Benz 500 K Sports Roadster with coachwork by Sindelfingen (estimate $3.8 to $4.9 million) is one of 7 to 12 cars made in this configuration. These cars all are slightly different with this matching numbers example one featuring a rare flat windshield. The car was originally delivered to London although factory records do not specifically recorded it as a right-hand drive model. The 1938 Mercedes Benz 540 K Roadster (estimate $3 to $3.8 million) wears a unique body by the English company Lancefield Coachworks rather than the more common styling by Sindelfingen. The elegant body has a fully disappearing top. The 1939 Mercedes Benz 540 K Cabriolet A (estimate $2.2 to $2.9 million) has the more conventional Sindelfingen coachwork that most 540K chassis were fitted with. The car was delivered to Berlin 20 days after Germany has invaded Poland and thus one of the last civilian cars produced before all production was limited for military and official use. The 1935 Mercedes Benz 500 K Cabriolet C (estimate $880,000 – $1.2 million) is also fitted with coachwork by Sindelfingen. 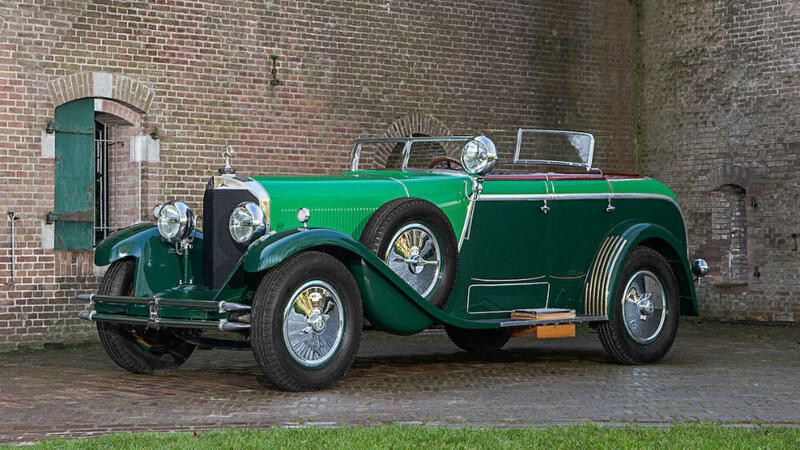 This four-seater cabriolet is a correct example with a high-quality restoration but comes at a fraction of the price the Saoutchik bodied example will demand in the same sale. The 1961 Mercedes Benz 300 SL Roadster (estimate $1.3 to $1.6 million) sold for €1,092,500 at the 2015 Mercedes Benz Museum sale. The car has since changed color and received some further work. This 1962 model is an original disc-brake model and comes with an extensive service history. The original German owner had it serviced 20 times during the first four years of ownership – 300 SLs require a service every 3,000 km. This 1961 Mercedes Benz 300 SL Roadster has been in single-family ownership for 48 years and comes with a hard top, although not original to the car. The 1953 Mercedes Benz 300 S Roadster (estimate $820,000 to $990,000) is one of only 141 ever produced. The 300 re-established Mercedes Benz as a top, elite carmaker in the 1950s. The car on offer was recently restored by Kienle Automobiltechnik. The 1957 Mercedes Benz 300 Sc Cabriolet (estimate $820,000 – $990,000) is even more rare – only 49 were produced. This sister car of the popular 300 SL was more expensive and more comfortable than its sportier Gullwing sibling but generally is harder to sell at auction and for significantly less. The 1971 Mercedes Benz 600 Landaulet (estimate $1.1 to $1.5 million) is one of only 59 landaulets built on the Pullman chassis. The favorite car of pop stars, actors and dictators, this Mercedes Benz 600 Landaulet was originally delivered to Senegal – almost certainly for the use of President Léopold Sédar Senghor. The car is currently on German registration and was partly restored in 2012. The 2009 Mercedes Benz SLR McLaren “Stirling Moss” (estimate $2.2 to $2.6 million) aims to follow the recent trend for limited edition, modern supercars to sell for top dollar. This is a single-owner car and one of only 75 produced in the “Stirling Moss” configuration (of 1,789 SLRs produced in total). The Swiss-registered car has covered only 7,200 km.